Shellfish are often paraded as the very best of Scotland's larder, but many of us are intimidated by the prospect of dealing with them at home. Expert fish and shellfish chef, Jim Cowie of the Captain’s Galley restaurant in Scrabster, gives us his personal guide to selecting and cooking his favourites. A fantastic species, healthy, versatile and widely available. 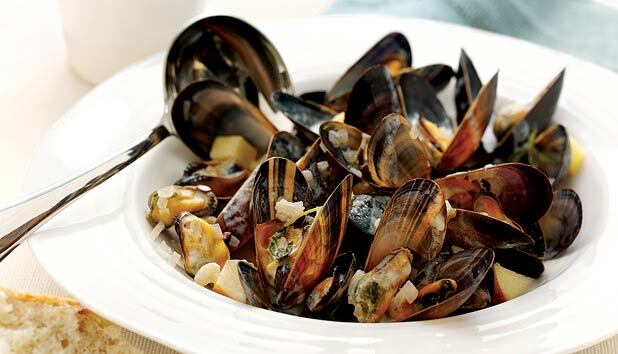 You can make a basic moules marnière with stock, cream, shallots and garlic. But it’s just as easy to do an Asian-style dish with coconut milk, Thai basil, lemongrass and lime. From start to eating, it shouldn’t take more than two minutes. It’s basically a really hot pan for a minute or so, then in with the ingredients for a few seconds and you’re done. If you have any left, use them to make a stock. I get my queenies from Orkney; the quality of the water there makes a big difference to the flavour. First I remove the barnacled side and then sit the scallop in the cupped part of the shell. Then I grill it with some garlic butter, fresh coriander and parsley – and perhaps a sprinkle of lemon juice. The more you complicate it, the more you risk spoiling it. King scallops are good as a main dish: three diver king scallops from Orkney barely fit on our restaurant plates. Although technically a different species, cockles and clams are very similar and, with my supplier, the two are interchangeable. I’ll often make a huge pot of New England clam chowder with onions, garlic, bacon and potatoes. Taste-wise, clams are a superior shellfish and they can add a lovely flavour to pasta or risotto. I also find them to be visually superior; so it’s sometimes nice just to steam them to open using stock or white wine, and then place them as a garnish around a larger piece of fish. Whelks are underutilised in Scotland, because we’re not adventurous enough. They are lovely lightly boiled in salted water and sliced thinly to taste. The meat is fantastic minced up and used in a Caribbean conch chowder, as the whelk is a perfect alternative to conch. I would never fly conch round the world when you can always find a local alternative. This chowder is tomato, rather than cream, based – with bacon, green peppers, chillies, bay leaves, tobacco, lime juice and spices. Any time I’ve had it in the Caribbean I’ve been given a bottle of sherry with it. A few glugs in the dish sets it off. A winkle is like a smaller version of a whelk. They are small, black shellfish found around the coastline of Scotland. To me they are a snacking food. I boil them up in heavily salted water, as it’s about trying to re-create the seawater environment they came from. I then add a dozen peppercorns and a couple of bay leaves, boil for a maximum of five minutes and then eat them as finger food. They are also good in a stir-fry: just take the pan off the heat and fold them through at the last minute. Due to their size they will cook in the steam. The first thing to look for is whether the crab is male or female. On the underside of the shell, between the small legs, the female has a wider ‘purse’ and the top side of her shell is more rounded. The female has more brown meat, because of her bigger body, and the male has bigger claws and so more white meat. Always pick a crab with a rich, brown coloured shell and lots of energy (ie fast moving legs). Feel for a weight of meat – depending on season, they can be light and watery. Often I use both white and brown meat in the same dish, like a nice crab salad with chunky guacamole, home-made crispy tortilla and lime granita. The brown meat gives an intense flavour and the white meat adds a nice texture. A nice way of doing them is in a ribbed steak griddle pan. Get the pan fairly hot and then angle the clams into the spars of the griddle and it will help keep them closed for long enough. Cook them for a minute to 90 seconds in butter and wine, then take the clams out and put the pan back on the heat, reduce the juices and add butter and chopped herbs. Serve them as they are, with just the clams and a little of the juice. And get away from the idea that it has to be piping hot to serve, that’s often when you ruin the fish. This is the king of fish to me, but be careful when choosing lobster – usually you can instinctively tell a good one, as it will be lively and heavy of body. They shed their shell each year, so you want one with a strong shell that hasn’t just been cast. If it’s not in season, I refuse to put it on the menu. The first thing I do when lobsters enter my kitchen is put them in a pan of salted boiling water for three to four minutes. This puts them out of their misery, as I believe that nothing gives us the right to be cruel to another creature. Then it’s a case of deciding whether to grill the meat in olive oil and herbs or steam it and use it as it is; it can also be left to cool for a salad. The ethics of fish use are changing and we’re beyond the days of just using part of a fish and discarding the rest. Langoustine is a good fish for allowing you to use all parts – even with the shell you can make good bisque. Be careful only to heat the meat through once, however, because if you stir it through a pasta, for example, and then continue cooking it, you will ruin the meat. It’s also particularly good in a stir fry with chilli, ginger, fried rice and some crunchy vegetables – but there’s no need for a sauce. No fish needs a heavy sauce – it’s about complementing it, not smothering it. Shrimp is excellent for poaching and shelling in risottos, pastas and stir-fries – but potted shrimp is a favourite. Take the shrimps and add butter, herbs, mace, cayenne pepper and nutmeg and cook in a hot pan. Then put it in little clay ramekins and let it all mingle together, before leaving it to set in the fridge. The butter solidifies and then you can serve it with warm toast. I don’t have shrimp on my menu, because I can’t get it locally and I don’t buy fish outwith a 50-mile perimeter. It just means I look forward to shrimp when I travel elsewhere.